Sunset at Curtain Falls is the fifth level of World 4 in Yoshi's Woolly World. The level begins with a cannon to a curtain. The curtain begins automatically moving, and Yoshi will cross many hordes of Gusties before getting onto another curtain with an Ukiki on it, followed by another curtain with three Ukikis on it. Following that is a pair of Fangs with a curtain directly above which Yoshi must get onto. It leads to two trampolines, which in turn lead to the first checkpoint and another curtain. This curtain leads to yet another, leading to an underground segment with Fangs. After traversing a few curtains, Yoshi is led back out into the open. A zigzag of movement between curtains follows, which then leads to a fast looping curtain, which in turn leads to a downwards-sloping curtain that leads directly to the goal roulette. Yoshi will need to jump off the curtain onto the ground to be able to reach the goal roulette. 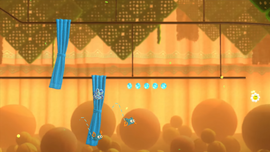 Smiley Flower 1: When getting off the curtain with the first Ukiki, Yoshi must take the lower curtain, which leads directly to the Smiley Flower. Smiley Flower 2: Immediately after the first two Fangs, on the path of the lower curtain. Smiley Flower 3: Immediately after collecting the third Wonder Wool, Yoshi must jump off the curtain at the end of its path and quickly flutter jump to collect the Smiley Flower. Smiley Flower 4: Immediately after exiting the underground area, Yoshi must jump off and reach the Smiley Flower, which is next to another curtain. Smiley Flower 5: At the final jump before the goal roulette. Wonder Wool 1: Directly at the end of the path of the curtain with three Ukikis. Wonder Wool 2: Directly at the jump after the last curtain before the first checkpoint. 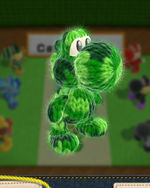 Wonder Wool 3: In the underground segment with Fangs, Yoshi must collect all beads to find the Wonder Wool at the end. Wonder Wool 4: At the end of the zigzag of curtains. Wonder Wool 5: At the end of the fast looping curtain. Collecting all of the Wonder Wools knits Camo Yoshi back together. This page was last edited on October 31, 2018, at 05:49.